(With apologies to Jerry Garcia). OK, so here’s the thing. 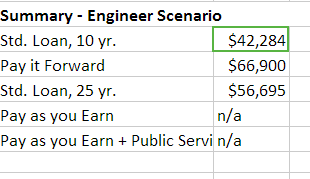 I just want someone to model what the Pay it Forward, Pay it Back plan looks like in a variety of cases compared to actual existing alternatives. That would seem an easy thing, something that legislatures and policy houses would do before taking positions on it. You’d think, at least. I come off as a person who is against Pay It Forward. I’m not. I’m against the Pay It Forward tulip madness that has engulfed otherwise reasonable people. There are some basic questions you should be able to answer before talking policy positions. Nobody I can find can answer those questions. That should freak you the heck out. Since no one seems to be interested in answering this, I went and dug up the formulas and wrote a spreadsheet. 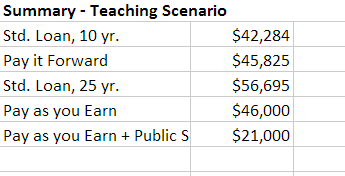 I modeled two scenarios — a single parent public school teacher, and a single engineer. I chose single people because the math for dual incomes gets too involved. Here’s the spreadsheet. If you find something I’ve done wrong in it, I’m not surprised (read the post title again). But if you do find an error, please do me a favor and rather than carping about it in the comments, fix the spreadsheet and show how it alters the model. Public School Teacher, one kid. Standard 10 year loan on $34,000 of debt. So this is payment over the life of a loan, 4.5% interest (higher than currently, but buffering a bit) on $34,000, which I’ve heard kicked around as median student debt held by borrowers (This sounds slightly off to me, but benefit of the doubt. I’m too tired to track down references). What we can see in our four-year scenario is what a difference that public service loan forgiveness policy makes. Pay it Forward is 75% more expensive than PYE with forgiveness. In this scenario, Pay it Forward essentially takes a $15,000 subsidy for public school teachers and throws it out the window. I haven’t modeled other government workers, police, military personnel, federal research scientists, community college professors, and state engineers, but I’d assume there are some lost subsidies there too. What’s more striking, however, is how even in this scenario the Pay it Forward option is not significantly off from the ten year loan or the pay as you earn options without the Public Service benefit. Now Pay it Forward is about the same as Pay as You Earn without the Public Service forgiveness. With the forgiveness Pay it Forward significantly more than double the lowest option. Most interestingly , Pay it Forward is more than the standard 10 year loan (although of course the 10 year loan has higher monthly payments than the 24-year PiF program, which is a factor). It’s surprisingly hard to see a clear benefit here. I could jack up the loan amount, which would up the standard loans, but even then the totals of the two Pay-as-You-Earn options would be the same, since they are based on income, not loan amount. For your median public school teacher, Pay it Forward appears to be a really lousy deal. What about for mechanical engineers? Here I got lazy. 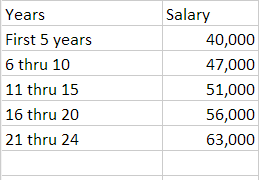 I found median starting income online and then increased it over the twenty-five year window assuming promotions to senior engineer and then some form of technical management. It’s clearly not as solid as the teaching numbers, but again, look at the post title. We want to model high flyers here. (Also, I live in Camas, Washington, which is engineer central because of the chip plant, and I will tell you these numbers are credible). This was the big surprise to me — how in the more realistic five-year model PiF becomes RISD–level expensive. Take your breath away expensive. With these assumptions, it’s easy to see why an engineer might opt for a school with a more standard loan program, and that makes me worry about our state research schools facing an engineer exodus. So on this model, again, no. 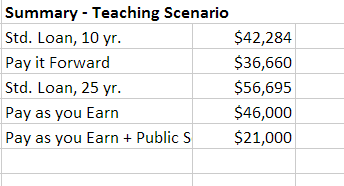 Assuming my math is correct and this is a raw deal for both the struggling public schoolteacher and the high-flying engineer, why is it so compelling? (And I do agree it’s compelling, even after looking at a total cost that was in both cases DOUBLE the best currently available option). There are a couple reasons. Lack of familiarity with current options is one. People just don’t know about the newer options for repayment. When testing a drug you don’t model against nothing, you model against the best possible available treatment. Same is true in public policy, but where anyone has bothered to model anything at all they’ve modelled against a student choosing the worst possible options for repayment. (And to be honest, most people have not even modelled that). But I *know* these options, and I still feel the pull of it. Why? Simplicity. This comes through in the spreadsheet creation. Creating the current options was annoying, and nearly impossible for joint filers. Pay it Forward is math you can do in your head. Highlights that college pays off. No matter what scare story Forbes is running this week, you are still better off going to college and accruing debt than not going to college. But scare story after scare story, sometimes from well-meaning people, has scared debt-averse populations away from college (which, guess what, are generally also minority and working class populations). In this paradigm, you might pay more (a *lot* more), but it’s not “debt”, so it’s OK. That opens college up to people overly worried about debt. There from the beginning. Here’s a big one — these repayment plans the government has? You don’t even get to decide to opt into them until your out of school. On top of that, they are portrayed as “hardship” plans. So when you are considering school, we can’t even talk about these. We have to present you the vanilla plan that is your worst possible plan. Add to that the fact that we are advertising a sticker price significantly higher than what you’ll actually pay, and we are doing everything in our power to put the worst possible spin on your loans. In other words, the genius of Pay it Forward is in its rhetoric, not its math. Now assuming the work I did above is right (which, let’s face it, is a big assumption) — is that rhetoric worth paying *double* what you might pay otherwise? Is it worth paying an extra $25,000 to $40,000 for school? I’d say no. But the rhetoric and the simplicity is worth a look. A lot more people should be modelling this against current options. But, in truth, the current options should be much easier to model. 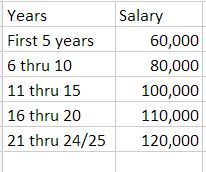 Can’t say I have been deeply involved with this whole issue, but one other scenario that might be interesting to see (for either of the above personas) is – what if their income for the first 5 years after graduation is nil, or substantially lower than a professional wage in their field BECAUSE THEY CAN’T GET A JOB. This seems like a pretty plausible issue for new grads. In that case IBR, Pay-as-you-Earn, and Pay It Forward all are roughly the same — they don’t charge you anything. users of blogging, that actually how to do blogging and site-building.